Damascus countryside, SANA- The Syrian Air Force and artillery on Thursday carried out precision strikes against terrorists’ positions in the remaining area in the north of al-Hajar al-Aswad neighborhood southern Damascus. 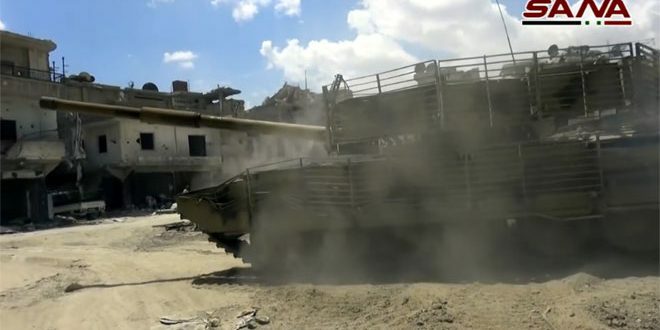 SANA reporter said that the army units operating in southern Damascus continued operations against the remaining terrorists in the north of al-Hajar al-Aswad neighborhood, tightening the noose on them and restoring control over many buildings blocks in the northwest of the neighborhood, in tandem with launching air and artillery strikes against the positions of terrorists. The reporter added that the military operations will contribute to eliminating terrorists.